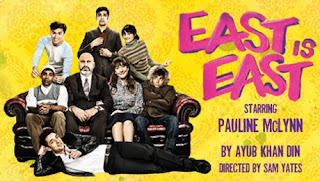 Most famously known as a result of the 1999 film adaptation, East is East is Ayub Khan Din's complex play about growing up mixed race in 1970s Britain. The Khan family are domineered by George "Genghis" Khan (Simon Nagra), a Pakistani immigrant who is married to his second British wife Ella (Pauline McLynn) and attempting to bring up his seven children in Salford while honouring the traditions of his own Muslim childhood. The piece charts the ups and downs of the family's life as George tries to torment his family into following his rules. Unsure whether they feel British or Pakistani, each of the Khan children face their own individual struggle with their race, religion and fear of the consequences of rebelling against their overbearing father while he too tries to overcome his own demons. It's impossible not to feel for the Khan children as they huddle together in the family chip shop to try and make sense of their father's actions. What's particularly striking about the piece is the unsettling feeling that it could in fact be being played out in houses today. The difficulties the Khan family face are no different to the tensions and struggle facing families across the UK. The ensemble cast produce outstanding performances that bring the Khan family to life with integrity. From laugh out loud moments to difficult scenes of domestic violence, the gritty reality of the piece shines through their performances. The honest portrayal of the Khan family is what gives this piece its heart and the cast give it genuine life. Meet them while you can.